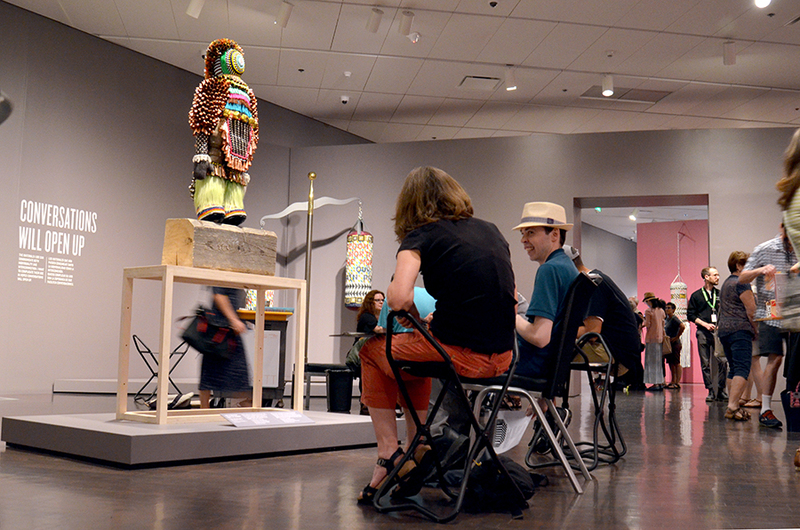 For Drop-In Drawing we explored the Jeffrey Gibson: Like a Hammer exhibition. Gibson takes inspiration from his Choctaw and Cherokee heritage, pan-Native American culture, alternative subcultures, and autobiographical experiences to explore colonialism and the post-colonial mindest. He works with universal themes of strength, community, love, vulnerability, and survival. 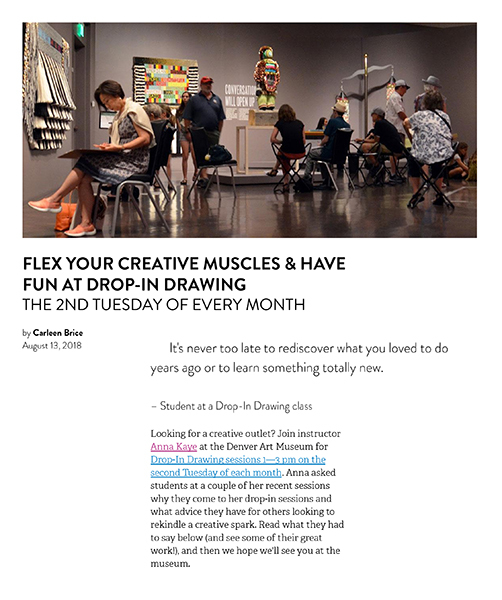 We participated in the Denver Art Museum's collection of Instagram photographs #GibsonLikeaHammer and Carleen Brice wrote an article on our session for her blog, "Flex your creative muscles and have fun at Drop-In Drawing." Barb Nabors and William Wise drawing "Like a Hammer"
In-progress drawing of "Head On"
"I am inspired by the texture and vibration of light and color in the exhibit." Barb Nabors' drawing of "Like a Hammer"
William Wise re-interprets "Like a Hammer." Participant took inspiration from the arrowheads of "What We Want, What We Need"
Ed Narvaez drew "Like a Hammer." He loved Gibson's use of color, texture, design, and rhythm. Greg Joyner's drawing of "Here it Comes." Cherie Fisk's drawing of "Horizon," she enjoyed the vibrancy of the colors. Elizabeth Arnold's draiwn gof "Burn for You." Mike Keene's drawing of "Bird of a Feather." 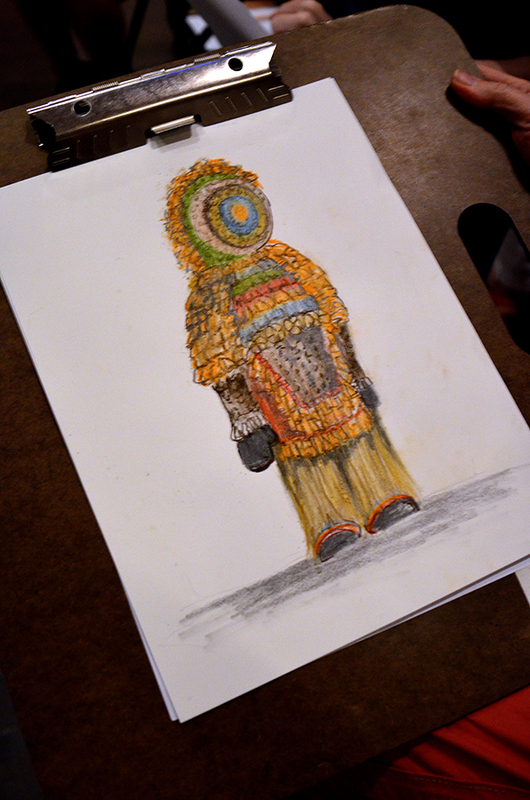 Gail Howard's drawing of "Beaded Column." 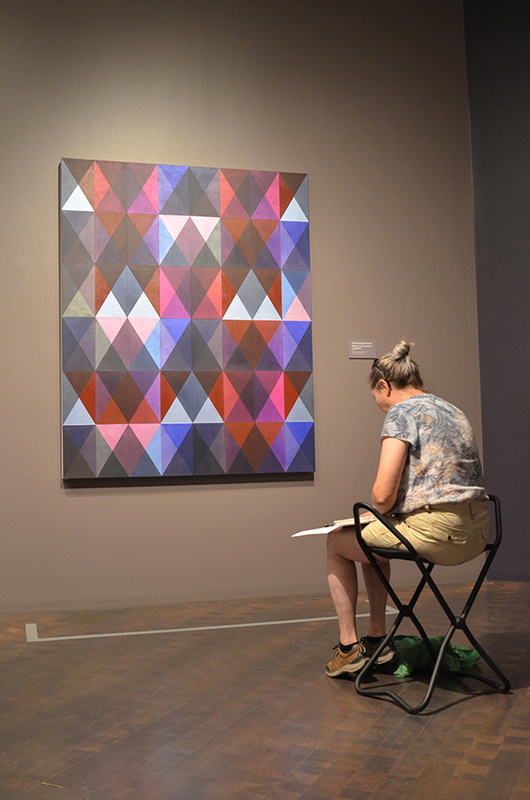 She appreciated the artist's use of color and music to celebrate native culture, modern culture, and change. Taking a look at all of the drawings at the end of the session.